A-Line's ill-fated Volvo B6 R178 NPN has stepped in for use on the 80s over the past few days due to ongoing problem with R651 YCR's gearbox. 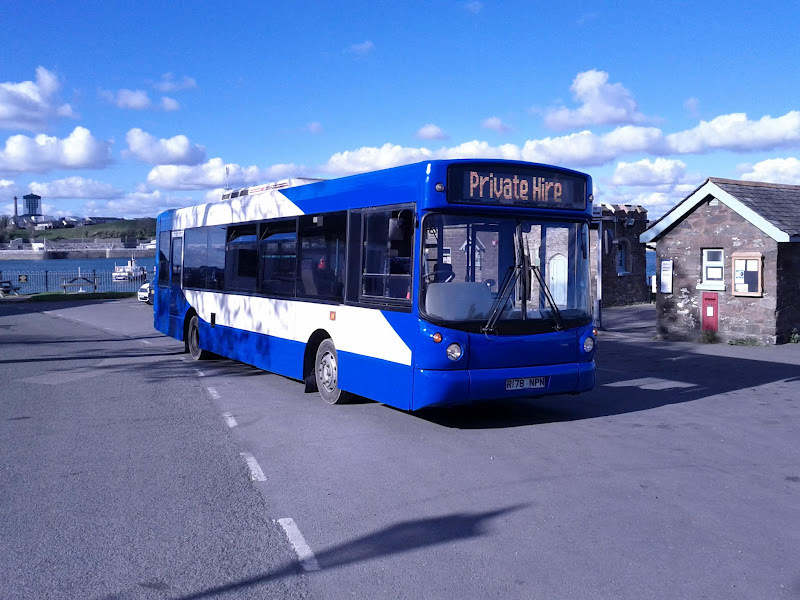 With the X reg Vario being used full time on the Liskeard services the B6 has been laid up down at the depot as the spare bus, so this has been its first run out for a few weeks. It certainly looks very smart and is indeed a pleasure to ride on, but size is again the issue with this bus. 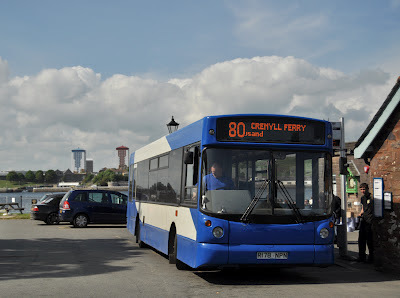 Although this extra capacity is very much welcome, with the Vario reaching capacity on the popular trips, the length and weight of the bus have meant the drivers have struggled to keep it on time on what is already quite a difficult schedule to keep to. 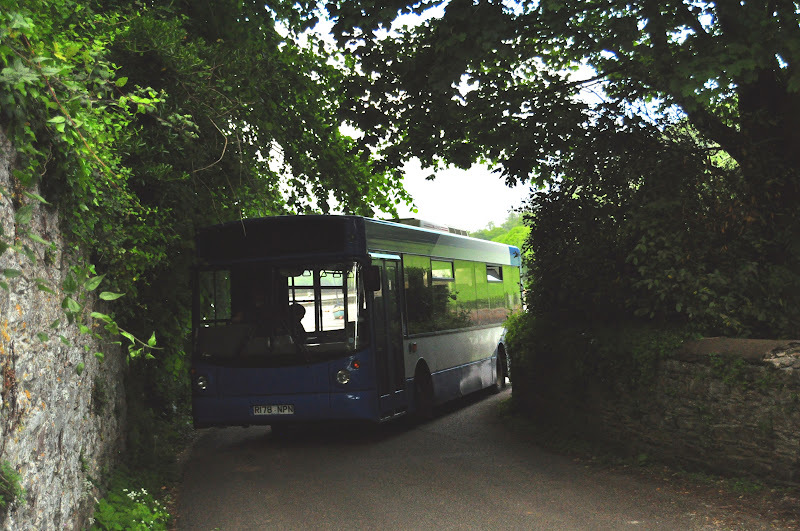 Although loading times are reduced thanks to the low floor, its noticeably slower on hills than the Varios, and corners such as the one you can see it negotiating below all build up the lengths of time for the journey, causing a knock on effect during the day, as was experienced on the Liskeard trips. It was a lovely send of though as I boarded R178 for what was my final day as a pupil of Devonport High School for Boys on Wednesday, before going onto study leave, with more exams up and coming over the next month. 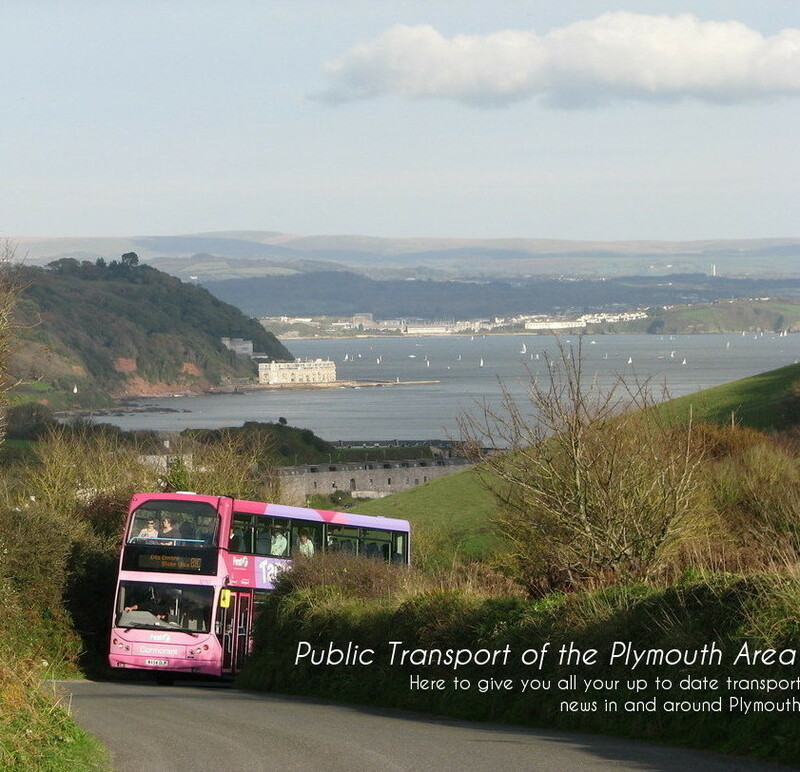 Then again, it would have been apt to finish my final day on a Vario, one of the few constants in my period at DHSB over the past 7 years, albeit the ones I traveled on in 2005 being newer, and owned by First! 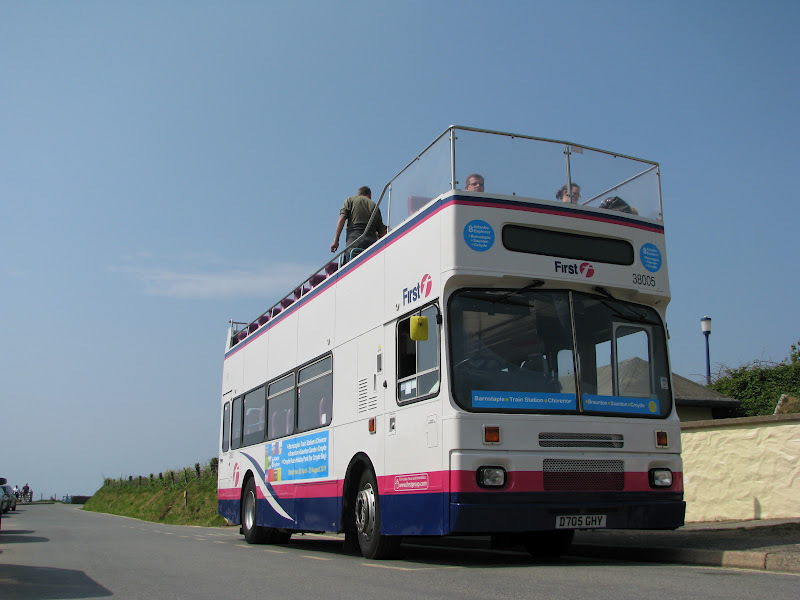 Unfortunately it appears that First Devon and Cornwall's open top service between Barnstaple and Croyde won't be materialising itself again this year. Although the day I travelled on it, it did seem quite busy, this was the first couple of days, so the town may well have lost interest later into the holiday season. Luckily though, this hasn't marked the end for the two Volvo B10Ms that were in use on the service, D701 GHY and D705 GHY. They've both been moved back to their old haunt of Weston Super Mare, in which their lives were played out on the X1 from Bristol to WSM when new. Now in open top format, they run the service from the Railway Station to Sand Bay. It seems somewhat unclear at the moment as to what has happened to the L reg Volvo Olympians that had previously been used on this service though. I can't see the B10Ms replacing these newer Olympians, and yet I wouldn't have thought there would have been much scope for a raising of frequency, especially now that this route now runs in competition with Crossville. All I can therefore suggest is that there is a regional manager somewhere up there who was desperate to have them back, I say with rose tinted spectacles on. They were certainly loved back then though, and maybe, just maybe, someone wanted their memories re-kindled within the town! 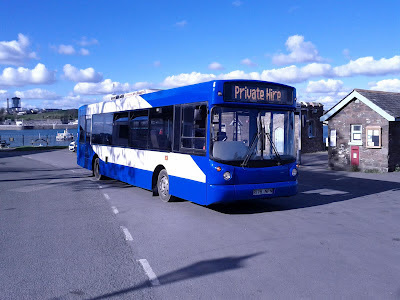 With many thanks to David Smith, I am able to give you a glimpse of the first of the Ex-Plymouth Park and Ride Dennis Enviro 400s to be painted in their new guise. Quite frankly, however much I loved the cloud livery, this new livery may just overtake it. Its certainly very bold, with some very nice little features, in particular the black headlight surrounds, along with relatively little intrusion across the windows. Then again, the X1 livery does appear to have the effect of squaring the body off, where as the P&R livery compliments the curves nicely. The P&R livery is also much more subtle and softer than X1, which works both in favor and against it. What I would definitely say though is that I wish that this X1 livery was what First Group were taking on as their new standardised livery, and not that of this horrible off lilac livery. The more I look at it the worse it seems to get, it hasn't grown on me at all as of yet, and it just seems such a shame, seeing as when they put their minds to it, First Group have produced some great liveries, such as the two seen here. X1's livery is a much nicer design, as well as having a nicer colour pallet, and I'd reckon this would probably look good on a wider range of vehicles than the new lilac livery is currently doing. As a footnote, you may have noticed that the destinations along the side look slightly short. That's because when they were first applied, Bristol and Weston Super Mare were the wrong way round, but the middle 3 were correct. They've taken these two off, but haven't yet got round to re-applying them in the correct order. Bit of an embarrising mistake! 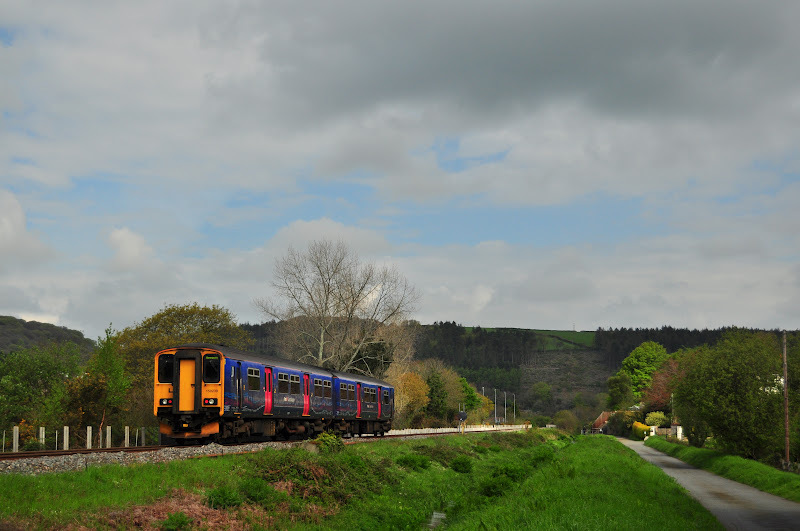 But then again, the rest of the Ex-Plymouth Enviro's are still running round in the be-branded cloud livery, and 33418 is still a completely blank canvas! You would have 'thought' this would have been the one to receive the new livery first! This evening a couple of film clips taken aboard the two Leyland Olympians that were on offer in Blackpool just after the Easter weekend, as mentioned before, was probably the final time 'proper' Leyland will operate in public service within Blackpool as more and more Tridents flood in to fill the gaps. 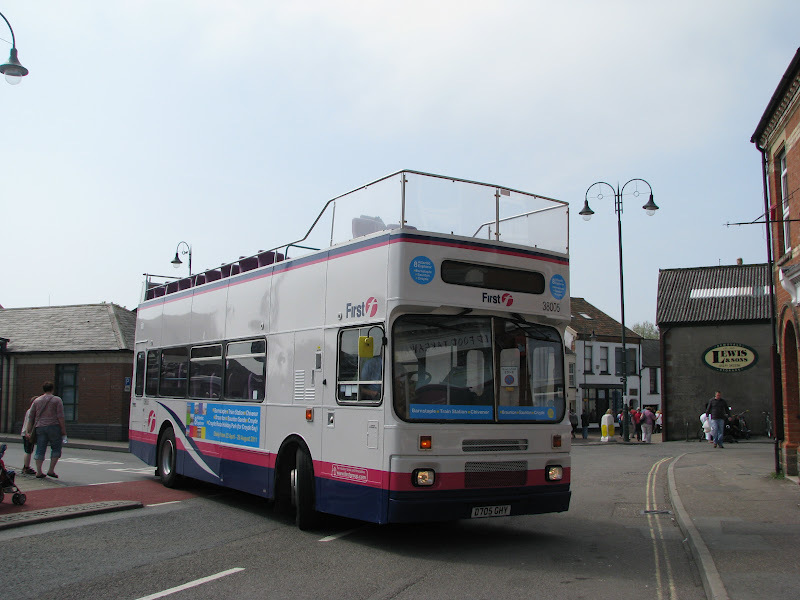 As luck would have it, each of the buses on offer that day had both the engine types avalible on Olympians, A719 YFS with the TL11, and D367 JJD with the more traditional Gardner 6LXB. 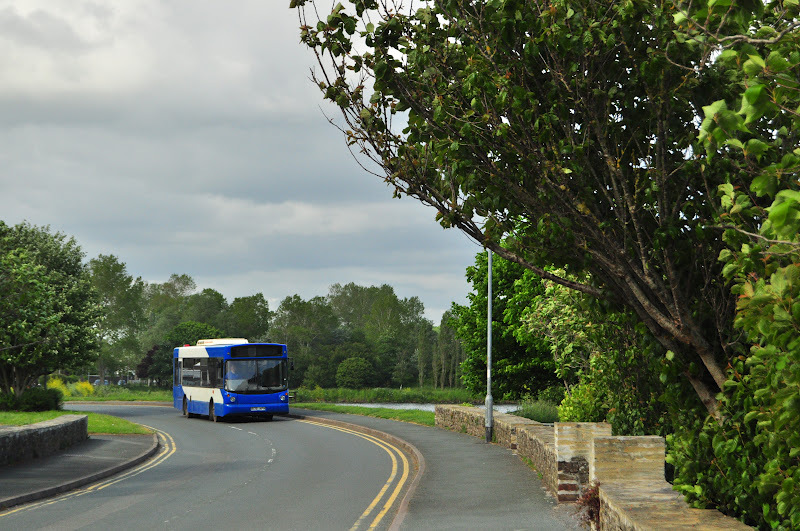 Firstly here is D367 JJD, the final Olympian ever to be bodied by ECW, heading outbound towards Marton Mere. And here we see A719 YFS heading inbound towards Blackpool with the TL11 whaling. One of the most interesting operations we came across on our tour of the North West was in Preston. The bus station itself had around 80 bays if memory serves me correctly, which gives you an indication of how vast the whole set up is in the city. In the short 30-40 minutes we had there, we encountered no less than 13 different types and bodies of buses, from 4 different operators. Preston Bus itself is a very interesting company, now owned by the Rotala Group, and its obvious that they've been putting in some real investment quite early on under their ownership, including the running of hybrid Optare Versas. The livery is just stunning, most definitely one of my favorites that you can find in the UK today, which amazingly seems to suit everything from a brand new Versa, right down to J reg Leyland Olympians. 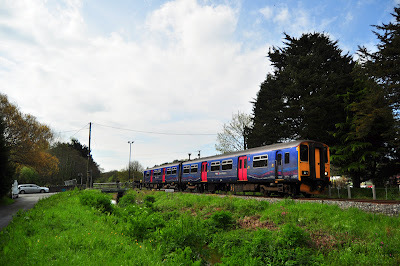 The re-paint scheme has also been very swift, with just 3 vehicles operating in the old livery at the time of photographing. As you can see from the photos, even in the early evening, the bus station was manic with activity; I would have loved to have spent a bit longer there to take it all in fully. Its great to see that none of the vehicles let the side down, even the oldest ones, making the whole operation have a very professional appearance. Stagecoach are the other big group giving them a run for their money, along with the ever famous Fishwicks, and Cumfybus. I'd certainly presume that loadings must be good to keep such a huge operation viable, but again, I didn't really have enough time there to take in fully how successful all these were. Certainly somewhere I'd like to visit again though, there's very few places in the UK you can get so much variety in one place. This week's Snap on Sunday comes to you from picturesque Par, taken along the river at the Middleway crossing, with First Great Western's 150239 doing the honours on the run down to Newquay. Unfortunately it seems that A-Line's latest addition to the fleet will be a short lived one due to various operational problems found with the vehicle over its first month of operation with the company. The vehicle's size has been a major factor in the decision, negotiating a vehicle of this size through small villages, Downderry in particular is no easy task, and has caused knock on delays throughout the day on the Liskeard services, which can only get worse during the summer period with increased traffic. This coupled with the huge fuel bill, with the bus averaging just 9mpg, concluding in the weekly fuel bill hovering between £900-1000. Shame considering the effort put in by various employees to get her to the wonderful standard she is currently presented in. I had my first trip on her yesterday, and indeed it goes very well indeed, by far the best B6 I've ever rode on, although, deafeningly loud! As you will hear from the video below, there sounds like quite a large air leak of some kind, which I'd presume is coming from the turbo. Certainly very comfortable though, and was a privileged to be driven on an exclusive journey, by the manager himself! The replacement vehicle is likely to be another Vario, but as always I shall keep you updated on any developments.